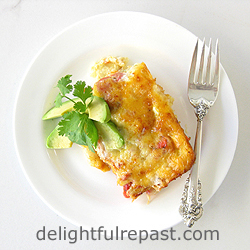 This easy chile relleno casserole is one I used to make years ago when we had vegetarian friends over for dinner and then when I was vegetarian myself. 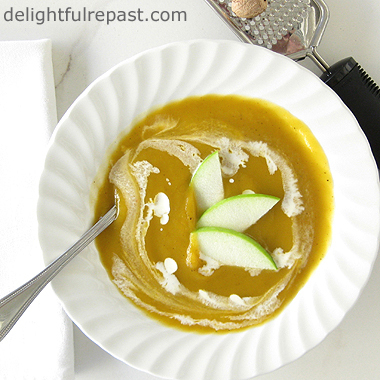 Now I'm what I call a part-time vegetarian, and this is perfect for my meat-free days. It's good for breakfast, lunch or dinner. It's also what I call a pantry meal because you can make it from ingredients you likely have on hand any time of year. Sure, you can sometimes buy fresh chiles and roast them yourself--by all means, go right ahead! But you'll get great results with canned chiles. And, if you make this at a time of year when fresh, local tomatoes aren't available, you can even use good canned tomatoes. I hadn't even thought of this dish in decades until I came across the little notebook I had written it in back when I was really young, possibly even a teenager. It was a real blast from the past for Mr. Delightful! If you, too, have been married since before the earth cooled, tell me about a dish you made in the early years of your marriage. If not, then tell me about whatever kind of food constitutes a "blast from the past" for you. 1 Grease 8x8x2-inch baking dish. Heat oil in small skillet and saute chopped onions until soft, about 5 minutes. Place half the onions in the dish. Layer on half the chiles, half the tortilla strips, half of each cheese and half the diced tomatoes. 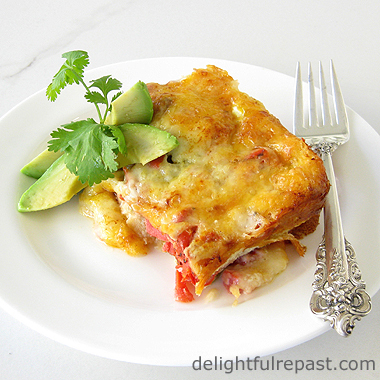 Then layer on the remaining tortilla strips, onions, chiles, tomatoes and cheeses. Note: Whether using fresh or drained canned tomatoes, give them a bit of a squeeze to get out some of the liquid just before adding them to the dish. 2 In medium bowl (I use a 1-quart glass measure), whisk together eggs, milk and seasonings. Pour over the layered ingredients. Sprinkle with paprika. Let stand at room temperature for about 20 minutes. Preheat oven* to 350F/180C/Gas4. * During hot weather, I bake this in my Cuisinart convection toaster oven. 3 Bake, uncovered, for about 40 minutes. Let stand for 10 minutes before cutting. Garnish each serving. Note: May be made ahead and refrigerated. If so, add 20 minutes to cooking time. 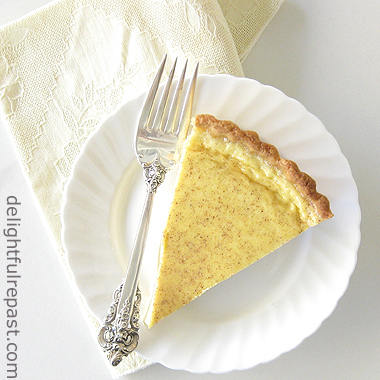 Classic Lemon Tart is an elegant dessert with "Wow" factor that's really quite easy. The pastry is crisp and cookie-like, so it's much easier to get right than a flaky pastry. 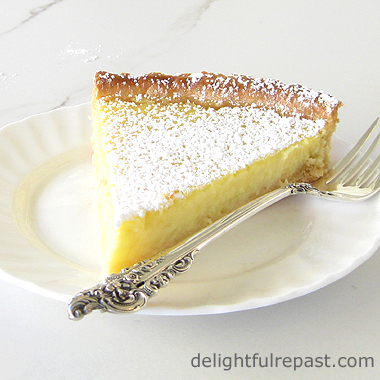 Some versions call for cooking a lemon curd and pouring it into a fully baked tart shell; others for cooking the filling, pouring it into the tart shell and baking it. This one is the kind with the uncooked filling baked in a prebaked tart shell. Sometimes I make both the pastry and filling by hand, but today I decided to make the pastry in the food processor. Then it was time to make the filling and I decided I might as well use the food processor to really pulverize the sugar and lemon zest for the filling. 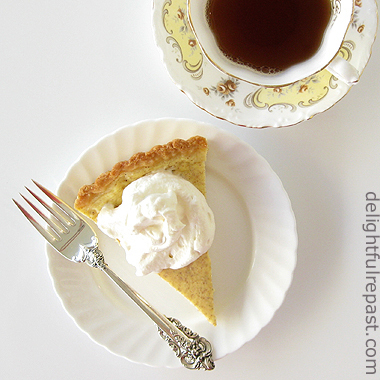 But if you don't have a food processor, don't let that stop you from making this tart; it'll be fine. I use all organic ingredients and have done for decades. Even if you aren't into organic, do try to get lemons that haven't been sprayed and waxed because you'll be zesting that outer layer of peel. We like our lemon desserts quite tart. If you don't, you might want to add a couple tablespoons more sugar to the filling; but I hope you'll try it this way first. 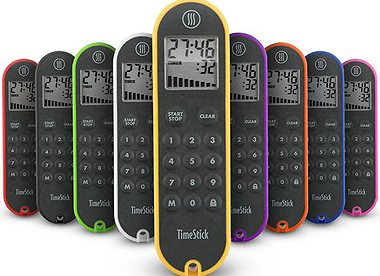 It's important not to overbake it, so I'm giving away not one, but three, ThermoWorks TimeSticks! You can either hang it around your neck or stick it in your pocket. It is my all-time favorite timer, and I've tried many! Details after the recipe. Note: Four medium lemons (4 to 4.5 ounces each) should yield enough juice and zest, but have a fifth on hand, just in case. 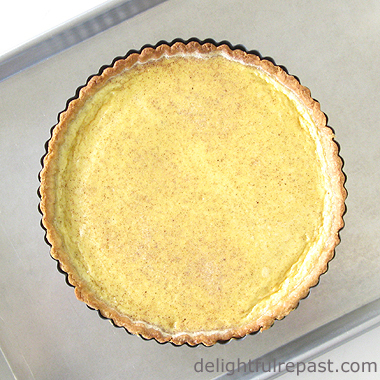 2 Lightly butter a 9-inch/23cm tart tin (1-inch deep) and set it on a baking sheet. On lightly floured 12-inch square of aluminum foil, roll out the pastry to a 12-inch circle. Transfer dough to tart tin, pressing dough (but not stretching it) to fit the tin. Save the foil; you're not done with it. With scissors or knife, trim the overhang to 1/2 inch all around. Fold it in and press it to the sides to form a thicker side crust. 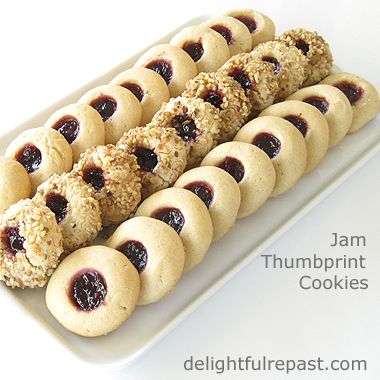 Trim the edges* by rolling the rolling pin over the top. 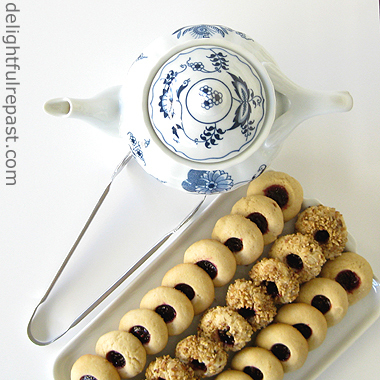 Press the pastry into the flutes so that it rises a bit above the edge (in case of shrinkage). Pop it in the freezer for 15 minutes while you preheat the oven to 375F/190C/Gas5. 4 While pastry is cooling, make the filling. In 2-quart bowl (I use a 2-quart glass measure), whisk together eggs, sugar, cream, lemon juice, lemon zest and salt until well combined. Let stand until pastry is ready. 5 Turn oven temperature down to 325F/165C/Gas3. Pour filling into prebaked pastry shell. Bake (with tart tin on baking sheet) for about 25 minutes, until just set and still with a bit of a wobble in the center. 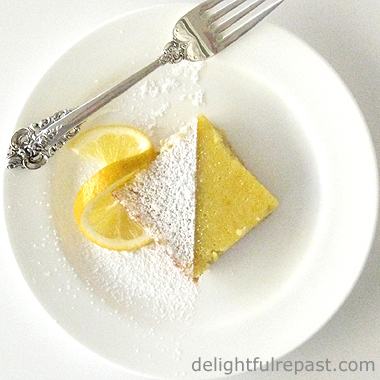 (Mr. Delightful has "texture issues," so I baked this one for 30 minutes. It didn't have a wobble, but it was fabulous!) Cool to room temperature, about 1 hour. Remove from tin. Serve at room temperature or chilled. Dust with sifted powdered sugar just before serving. This giveaway is open to US residents (Sorry, international friends!) 18 years of age or older. To enter (one entry per person), just leave a comment below. Please include your email address in the body of your comment. Must enter by 11:59 p.m. Eastern time Wednesday October 7. Three winners will be chosen by random drawing and be announced here in the comments before noon Eastern time on Thursday October 8. If I don't hear back from the winners of the random drawing by noon Eastern time Sunday October 11, another drawing will be held and new winner(s) selected from the original entrants (those who commented before the giveaway deadline). 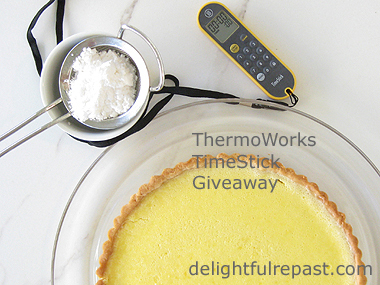 Disclosure: ThermoWorks, makers of the new and improved Thermapen, provided a TimeStick for review purposes and three for the giveaway. The views expressed here are entirely my own. I always tell my readers what I really think!